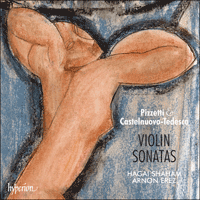 Hagai Shaham and Arnon Erez continue their exploration of the early twentieth-century violin repertoire, turning this time to Italy. These musicians are noted for their full-blooded performances: here they revel exuberantly in the music’s operatic passion. Pizzetti was at the height of his fame at a time when Italian music was all the rage; his pupil Castelnuovo-Tedesco eventually fled Italian anti-semitism to embark on a successful career in Hollywood. Pizzetti’s Violin Sonata in A major was described by the late John C G Waterhouse, Britain’s leading authority on twentieth-century Italian music, as ‘much the most impressive sonata for violin and piano that has ever been written by an Italian’. His Tre canti were written in 1924, originally for cello and piano, then transcribed by the composer for violin. Castelnuovo-Tedesco’s Sonata quasi una fantasia, Op 56, was composed in 1929, with a dedication to the Hungarian violinist Adila Fachiri (also the dedicatee of Bartók’s two violin sonatas). The Tre vocalizzi were originally written in 1928 as vocalises for wordless voice and piano. They were subsequently arranged for violin and piano by Mario Corti, who saw the potential in these pieces for transcriptions that used violin techniques to imaginative effect, with extensive use of double-stopping and harmonics, as well as a greatly expanded compass, using octave transpositions to exploit the instrument’s entire range. Gatti wrote this at a time when Italian music was achieving considerable international renown: Puccini was at the height of his fame; in 1918 Il Trittico had been given its premiere at the Metropolitan Opera, and in 1920 he started composing Turandot. Respighi’s Fountains of Rome (the first of his Roman Trilogy) was completed in 1916 and La boutique fantasque (after Rossini) was given its premiere at London’s Alhambra Theatre by Diaghilev’s Ballets Russes in 1919. Given the widespread success of composers such as Puccini and Respighi in the years just after World War One—and the emergence of Malipiero and Casella—it is fascinating that Gatti chose Ildebrando Pizzetti as the finest of them all. Pizzetti’s most ambitious work from before World War One was the opera Fedra (with a libretto by Gabriele D’Annunzio) in which his declared aim was to reform Italian opera by learning from the examples of Monteverdi on the one hand, and of Wagner on the other. With a score of sometimes startling austerity, when Fedra was staged at La Scala in 1915 it was a failure, and was dropped from the repertoire after just four performances. Pizzetti’s long career included a number of other operatic projects, notably Débora e Jaéle and Assassinio nella cattedrale, based on an Italian version of T S Eliot’s Murder in the Cathedral (and introduced at La Scala in 1958). Pizzetti worked on Débora e Jaéle from 1915 until 1921—the time of the Violin Sonata recorded here—and it was first produced at La Scala on 16 December 1922, conducted by Arturo Toscanini. Puccini was in the audience, and wrote about the opera to his friend Riccardo Schabl: ‘For me it doesn’t work, but surely (I want to listen to it again) there are things of the highest interest.’ What bothered Puccini was the lack of strong melodic content—something he felt was likely to doom the work to a short life in the theatre. But it was just this side of Pizzetti’s musical character—somewhat austere, ascetic, and rigorous—that had such a strong appeal for progressive commentators such as Gatti, and for younger composers. Pizzetti … has attained a style, or at least a personal idiosyncrasy—something to bind his various works together … in Pizzetti’s case it often causes one to wonder just why, if he is so anti-classical, he retains certain classical phrasings, on what grounds he accepts, on what grounds he rejects this or that part of the tradition. Here he has joined piano and violin so that the combination is not annoying, but he has hardly discovered a unified musical dialect. The second movement did not retain one’s attention; the third demonstrated Pizzetti’s capacity for dance tune. There is a severe reliance on the plain statement of ideas which shows the matured mind. The emotional sequence of the three movements is described by headings, ‘Tempestoso’, ‘Preghiera per gl’innocenti’ and ‘Vivo e fresco’, and, though a more detailed programme has been put forward connecting it with the war, it is as music and not as musical description that the hearer is asked to perceive its impressions … The influences of ecclesiastical plainchant are felt in several themes of the first two movements, and the lilt of a folksong rhythm is strong in the finale… . His most interesting moments are generally found in the entries of the violin, the first one of all, for example, where its long-drawn notes and the rise of a semitone make a remarkable contrast with the reiterated rhythm which the piano has been developing. Pizzetti’s Sonata has had already an exceptionally favourable reception. Time alone will prove whether its qualities are enduring—they are undoubtedly striking … Pizzetti seems to have drawn his inspiration and his strength from the popular national form—opera. There is nothing ‘theatrical’ in the usual sense, yet he does give us the atmosphere of the drama of the theatre, but with the power, freedom and art that are essentially of the classicist. These early reviews allude to three significant aspects of the work: its programme, specifically its link with the war; its dramatic, almost vocal style of writing in places; and Pizzetti’s individual amalgam of earlier music (particularly plainchant) with a more progressive harmonic language—all within a classical framework. The first movement is marked Tempestoso and begins with a terse piano theme, characterized by falling fourths; this rises to a climax before the first entry of the violin which plays a long phrase marked by rising and falling semitones, over the obsessive, agitated piano writing. Throughout this opening section, the violin and piano stick strictly to their own musical ideas. Following the introduction of a more solemn, chant-like melody in the piano’s lower register, the violin again answers with contrasting material: only later in the movement does it take up the piano theme. As this long, motivically rich movement draws to a close, fragments of the falling fourth idea from the start, and the violin’s plangent falling semitones push the music towards a strong close in A minor. The second movement is the emotional heart of the work, a ‘Prayer for the Innocents’. In an article about Pizzetti for Musical Quarterly in 1923, Gatti described its programmatic outline in poetic terms: ‘Here the tempest is stilled; man again finds his faith, and clings to it with every fibre of his being; that peace which his fellow men are unable or unwilling to grant him, he humbly implores of God, while from his lips fall the tenderest, the simplest, the most heartfelt words that he has spoken since childhood.’ In a form that feels spontaneous and fluid, Pizzetti’s music in this ‘Prayer’ is sometimes declamatory, but always intensely melodic. There’s an explicitly song-like character to the aristocratic opening theme in C major: Gatti noted that the composer imagined this melody being sung to the words ‘O Signor Iddio nostro, o Signore, abbi pietà di tutti gli innocenti che non sanno perchè si deve soffrire’ (‘O Lord our God, O Lord, have pity on all the innocent ones who know not why they have to suffer’). The same theme makes an intense and passionate return later in the movement (now in E major, and on the violin). The finale brings with it a sense of optimism and renewal, though in purely musical terms it is not perhaps as imaginative and resourceful as the first two movements. But it bristles with dance-like vitality, leading to a broad and noble close. The late John C G Waterhouse, Britain’s leading authority on twentieth-century Italian music, was in no doubt about the quality of Pizzetti’s Violin Sonata, describing it as ‘much the most impressive sonata for violin and piano that has ever been written by an Italian’. It was regularly played abroad, and the composer himself included it in a concert of his chamber music at the Library of Congress in Washington DC on 5 March 1930, during his first visit to the United States. He was already a familiar name to American concert audiences: announcing the 1930 visit, Time magazine described Pizzetti as ‘the famed Italian composer’ and hailed his stay as ‘a major musical event’—its patrons included Pizzetti’s friend Toscanini, the Director of the Metropolitan Opera Giulio Gatti-Casazza, Helen Astor, and Elizabeth Sprague Coolidge, who had commissioned Pizzetti’s Piano Trio in 1925 and would later commission his Second String Quartet. Yehudi Menuhin recorded the Violin Sonata with his sister Hephzibah in May 1938—a remarkable but well-deserved vote of confidence from a British record company in a modern Italian instrumental work lasting almost half an hour. Pizzetti’s Tre canti were written in 1924, originally for cello and piano, then transcribed by the composer for violin. This is much less ambitious music, conceived on a smaller scale and at a lower emotional temperature than the Violin Sonata, but exuding considerable charm in the first two pieces, and becoming more dramatic in the third. Castelnuovo-Tedesco’s Tre vocalizzi were originally written in 1928 as vocalises for wordless voice and piano. They were subsequently arranged in 1930 for violin and piano by Mario Corti, a distinguished Italian violinist, and one of the most devoted early advocates of the violin sonatas by Pizzetti and Respighi. Corti saw the potential in these pieces for transcriptions that used violin techniques to imaginative effect, with extensive use of double-stopping and harmonics, as well as a greatly expanded compass, using octave transpositions to exploit the instrument’s entire range. Each of the vocalises has a subtitle. The first is a rhapsodic Andantino entitled Pan ed Eco; the second is solemn and melancholy, Come una nenia marinaresca (‘like a maritime lament’); and the third, marked Tempo di Fox Trot is subtitled American Music—something Castelnuovo-Tedesco was to experience at first hand a decade later, when he embarked on a successful career in Hollywood. Quand Gatti prononça ces mots, la musique italienne atteignait à une immense renommée internationale—Puccini était au sommet de sa gloire: Il Trittico avait été créé au Metropolitan Opera en 1918 et, en 1920, il avait entamé la composition de Turandot. L’année 1916 avait vu l’achèvement de Fontaines de Rome, le premier volet de la Trilogie romaine de Respighi, dont La boutique fantasque (d’après Rossini) avait été créé à l’Alhambra Theatre de Londres par les Ballets russes de Diaghilev, en 1919. Vu le triomphe remporté par de tels compositeurs dans l’immédiat après-guerre—sans oublier l’émergence de Malipiero et de Casella—, il est fascinant que Gatti ait pensé à Ildebrando Pizzetti comme au meilleur de tous. Avant la Première Guerre mondiale, l’œuvre la plus ambitieuse de ce compositeur avait été l’opéra Fedra (sur un livret de Gabriele d’Annunzio), écrit dans le but avoué de réformer l’opéra italien en apprenant de Monteverdi d’une part, de Wagner d’autre part. Monté à La Scala en 1915, Fedra, d’une austérité parfois surprenante, fut un échec—il fut retiré du répertoire après seulement quatre représentations. Dans sa longue carrière, Pizzetti eut plusieurs autres projets opératiques, notamment Débora e Jaéle et Assassinio nella cattedrale, d’après une version italienne de Murder in the Cathedral de T. S. Eliot (présenté à La Scala en 1958). Il travailla à Débora e Jaéle de 1915 à 1921—époque de la Sonate pour violon enregistrée ici—et la première eut lieu à La Scala le 16 décembre 1922, sous la direction d’Arturo Toscanini. Puccini était dans le public et voici ce qu’il écrivit à son ami Ricardo Schabl: «Pour moi, cela ne marche pas, mais il y a assurément (je veux le réécouter) des choses du plus haut intérêt.» Ce qui chagrinait Puccini, c’était l’absence de contenu mélodique fort—ce qui, il le sentait, condamnait l’œuvre à brève échéance. Or ce fut précisément cette facette de la personnalité musicale de Pizzetti—un rien austère, ascète et rigoriste—qui attira tant les commentateurs progressistes, comme Gatti, et les jeunes compositeurs. Pizzetti … est parvenu sinon à un style, du moins à un tour très personnel—quelque chose à même d’unir ses différentes œuvres … Chez Pizzetti, on en vient souvent à simplement se demander pourquoi, s’il est si anticlassique, il conserve certains phrasés classiques et selon quels critères il admet ou rejette tel ou tel élément de la tradition. Ici il a mêlé le piano et le violon en une combinaison qui n’est pas gênante, mais il n’a pas pour autant découvert un dialecte musical unifié. Le deuxième mouvement n’a pas retenu notre attention; le troisième a démontré l’aptitude de Pizzetti à l’air de danse. Il existe une intense dépendance vis-à-vis de la simple énonciation d’idées, qui montre un esprit mûri. La séquence émotionnelle des trois mouvements est dépeinte par des titres («Tempestoso», «Preghiera per gl’innocenti» et «Vivo e fresco») et, quoiqu’un programme plus détaillé propose de la rattacher à la guerre, l’auditeur, lui, doit percevoir les impressions d’une musique et non d’une description musicale … Les influences du plain-chant ecclésiastique se font sentir dans plusieurs thèmes des deux premiers mouvements, et le finale est très marqué par l’inflexion d’un rythme de chant populaire … Chez lui, les moments les plus intéressants se trouvent, en général, dans les entrées du violon—ainsi la toute première, où les notes étirées et la hausse d’un demi-ton contrastent remarquablement avec le rythme réitéré développé par le piano. La Sonate de Pizzetti a déjà reçu un accueil exceptionnellement favorable. Seul le temps nous dira si ses qualités sont durables—elles ne laissent pas d’être saisissantes … Pizzetti paraît avoir puisé son inspiration et sa force dans la forme nationale populaire: l’opéra. Non pas que se dégage quoi que ce soit de «théâtral» au sens habituel du terme, mais il nous offre vraiment l’atmosphère dramatique du théâtre, avec toutefois cette puissance, cette liberté et cet art qui sont d’abord ceux du classiciste. Ces critiques anciennes renvoient à trois aspects importants de la Sonate: son programme, en particulier son lien avec la guerre; son style par moments dramatique, presque vocal; et l’amalgame singulier qu’elle opère entre musique du passé (notamment le plain-chant) et vocabulaire harmonique davantage progressiste—le tout dans une structure classique. Le premier mouvement, marqué Tempestoso, s’ouvre sur un thème pianistique concis, que caractérisent des quartes descendantes; passé un apogée, le violon fait sa première entrée et exécute une longue phrase marquée par des demi-tons ascendants et descendants, par-dessus une écriture pianistique obsessionnelle, agitée. Pendant toute cette section inaugurale, violon et piano s’en tiennent strictement à leurs idées musicales. Après l’introduction d’une mélodie plus solennelle, façon plain-chant, dans le registre inférieur du piano, le violon répond de nouveau avec un matériau contrastif et c’est seulement plus tard dans le mouvement qu’il reprend le thème pianistique. Alors que ce long mouvement, d’une grande richesse motivique, touche à sa fin, des fragments de l’idée liminaire en quarte descendante et les plaintifs demi-tons violonistiques descendants poussent la musique vers une puissante conclusion en la mineur. Le deuxième mouvement, véritable cœur émotionnel de l’œuvre, est une «Prière pour les innocents», dont Gatti décrivit poétiquement le contour programmatique dans un article de Musical Quarterly (1923) consacré à Pizzetti: «Ici, la tempête s’est apaisée; l’homme retrouve la foi et s’y accroche de toutes les fibres de son être; cette paix que ses semblables ne peuvent ou ne veulent lui accorder, il l’implore humblement de Dieu, tandis que ses lèvres laissent échapper les paroles les plus tendres, les plus simples, les plus sincères qu’il ait prononcées depuis l’enfance.» Dans une forme qu’on sent spontanée et fluide, la musique de cette «Prière» est parfois déclamatoire, mais toujours intensément mélodique. L’aristocratique thème inaugural en ut majeur a un caractère explicitement cantabile; et Gatti de souligner que Pizzetti imaginait cette mélodie assortie des paroles «O Signor Iddio nostro, o Signore, abbi pietà di tutti gli innocenti che non sanno perchè si deve soffrire» («Ô Seigneur notre Dieu, ô Seigneur, prends pitié de tous les innocents qui ne savent pas pourquoi ils doivent souffrir»). Ce même thème reviendra avec intensité et ferveur dans le mouvement (désormais en mi majeur et au violon). Le finale draine un sentiment d’optimisme et de renouveau, même si, en termes purement musicaux, il n’a peut-être pas l’imagination et l’inventivité des deux mouvements précédents. Il n’en fourmille pas moins d’une vitalité dansante, pour aboutir à une conclusion ample et majestueuse. Le défunt John C. G. Waterhouse, grand spécialiste britannique de la musique italienne du XXe siècle, ne doutait pas de la qualité de cette œuvre qu’il décrivit comme étant «de beaucoup la plus impressionnante sonate pour violon et piano jamais écrite par un Italien». Elle fut régulièrement jouée à l’étranger et Pizzetti lui-même l’inscrivit au programme d’un concert consacré à sa musique de chambre à la Library of Congress de Washington D. C. le 5 mars 1930, lors de son premier séjour aux États-Unis. Les mélomanes américains connaissaient déjà bien son nom: pour annoncer ce séjour, le magazine Time présenta Pizzetti comme «le célèbre compositeur italien» et salua en sa venue «un événement musical majeur»—le soutenaient notamment son ami Toscanini, Giulio Gatti-Casazza (le directeur du Metropolitan Opera), Helen Astor et Elizabeth Sprague Coolidge, commanditaire de son Trio avec piano de 1925 et, plus tard, de son Quatuor à cordes nº 2. En mai 1938, Yehudi Menuhin et sa sœur Hephzibah gravèrent la Sonate pour violon—un remarquable, mais très mérité, vote de confiance d’une maison britannique en faveur d’une œuvre instrumentale italienne moderne, de presque une demi-heure. Pizzetti rédigea ses Tre canti pour violoncelle et piano en 1924, avant de les transcrire pour violon. Comparé à la Sonate, ils sont bien moins ambitieux, conçus à moindre échelle et avec moins de fièvre émotionnelle, mais exsudent énormément de charme dans les deux premiers morceaux, le troisième prenant un tour plus dramatique. Castelnuovo-Tedesco conçut d’abord ses Tre vocalizzi (1928) comme des vocalises accompagnées au piano. En 1930, elles furent arrangées pour violon et piano par l’éminent violoniste italien Mario Corti, l’un des premiers et des plus ardents défenseurs des sonates pour violon de Pizzetti et de Respighi. Corti sentit combien ces pièces pouvaient se prêter à des transcriptions recourant aux techniques violonistiques, pour un effet plein d’invention, avec un large usage des doubles cordes mais aussi un ambitus fort large, exploitant des transpositions à l’octave pour profiter de toute l’étendue de l’instrument. Chaque vocalise est sous-titrée. La première est un Andantino rhapsodique intitulé Pan ed Eco; la deuxième est une solennelle et mélancolique Come una nenia marinaresca («Comme une lamentation marine»); la troisième, marquée Tempo di Fox Trot, est sous-titrée American Music—Castelnuovo-Tedesco l’expérimentera de première main dix ans plus tard, quand il se lancera dans une brillante carrière, à Hollywood. Gatti schrieb dies in einer Zeit, in der das Ansehen der italienischen Musik international beträchtlich zunahm: Puccini befand sich auf der Höhe seines Ruhmes; 1918 wurde Il Trittico an der Metropolitan Opera uraufgeführt, und 1920 begann Puccini mit der Komposition von Turandot. Respighis Fontane di Roma (das erste Werk seiner Römischen Trilogie) wurde 1916 vollendet, und die Premiere von La boutique fantasque (nach Rossini) fand 1919 im Londoner Alhambra Theatre mit Diaghilews Ballets Russes statt. In Anbetracht des weitverbreiteten Erfolges von Komponisten wie Puccini und Respighi in den Jahren gleich nach dem Ersten Weltkrieg und des Hervortretens von Malipiero und Casella ist es erstaunlich, dass Gatti Ildebrando Pizzetti zum Besten von ihnen erklärte. Pizzettis anspruchsvollstes Werk aus der Zeit vor dem Ersten Weltkrieg war die Oper Fedra (mit einem Libretto von Gabriele D’Annunzio), mit der er ausdrücklich die italienische Oper reformieren wollte, indem er einerseits Monteverdi und andererseits Wagner zum Vorbild nahm. Auf Grund der gelegentlich erstaunlich herben Musik war Fedra bei der Premiere 1915 an der Scala ein Mißerfolg und verschwand nach gerade vier Aufführungen aus dem Repertoire. Pizzetti befaßte sich in seiner langen Karriere mit einigen weiteren Opernprojekten, insbesondere Débora e Jaéle und Assassinio nella cattedrale nach einer italienischen Fassung von T. S. Eliots Murder in the Cathedral („Mord im Dom“); diese Oper wurde 1958 an der Scala aufgeführt. Pizzetti arbeitete von 1915 bis 1921 an Débora e Jaéle (in der Zeit, als auch die hier eingespielte Violinsonate entstand); und das Werk wurde am 16. Dezember 1922 unter der Leitung von Arturo Toscanini an der Scala uraufgeführt. Puccini befand sich unter den Zuschauern und berichtete seinem Freund Riccardo Schabl über die Oper: „Meiner Meinung nach ist sie mißlungen, es gibt aber sicherlich höchst interessante Dinge darin (ich möchte sie noch einmal hören).“ Puccini störte der Mangel an starken Melodien, weshalb sich das Werk seiner Meinung nach nicht lange auf dem Theater würde halten können. Doch gerade diese Seite von Pizzettis recht strengem und asketischem Musikstil war für fortschrittliche Kommentatoren wie Gatti und jüngere Komponisten von so starkem Reiz. Pizzetti … ist zu einem Stil (oder zumindest einer persönlichen Eigenart) gelangt, der seine verschiedenen Werke verbindet … in Pizzettis Fall kommt dabei oft die Frage auf, weshalb er, wenn er so gegen die Klassik ist, doch gewisse klassische Phrasierungen beibehält und weshalb er traditionelle Elemente akzeptiert oder verwirft. Hier hat er Klavier und Violine so kombiniert, dass es nicht störend wirkt, aber eine einheitliche Musiksprache hat er kaum gefunden. Der zweite Satz nahm nicht gefangen; der dritte zeigte Pizzettis Geschick für tänzerische Weisen. Hier herrscht ein ernsthaftes Vertrauen in die klare Aufstellung von Gedanken, in der sich ein gereifter Geist erweist. Die Überschriften der drei Sätze beschreiben die aufeinanderfolgenden Emotionen: „Tempestoso“, „Preghiera per gl’innocenti“ und „Vivo e fresco“; und obgleich ein genaueres Programm vorangestellt wurde, das die Musik mit dem Krieg verbindet, soll der Hörer die Eindrücke als Musik und nicht als musikalische Beschreibung wahrnehmen … Man erkennt den Einfluß von Kirchengesängen in einigen Themen der ersten beiden Sätze, und im Finalsatz tritt der schwungvolle Volksliedrhythmus deutlich hervor … Seine interessantesten Momente finden sich hauptsächlich in den Violineinsätzen, z. B. im ersten Satz, in dem die langgezogenen Töne und der aufsteigende Halbton auffallend zum wiederkehrenden Rhythmus kontrastieren, den das Klavier entwickelt. Pizzettis Sonate wurde bereits außerordentlich günstig aufgenommen. Nur die Zeit kann zeigen, ob ihre zweifellos beachtliche Qualität Bestand hat … Pizzetti scheint seine Inspiration und Stärke aus der beliebten nationalen Gattung, der Oper, zu beziehen. Es gibt nichts „Theatralisches“ im üblichen Sinn, doch er vermittelt eine dramatische Theateratmosphäre, freilich mit der Kraft, Freiheit und Kunst, die für einen Klassiker wesentlich sind. Diese frühen Rezensionen verweisen auf die drei bedeutenden Aspekte des Werkes: das Programm, insbesondere die Verbindung mit dem Krieg, der gelegentlich dramatische, fast gesangsartige Stil sowie Pizzettis ganz eigene Mischung aus älterer Musik (besonders Choralgesang) und einer progressiveren Harmonik—all das innerhalb eines klassischen Rahmens. Der erste Satz trägt die Bezeichnung Tempestoso und beginnt mit einem knappen Klaviermotiv aus charakteristischen absteigenden Quarten; dies steigert sich zu einem Höhepunkt, bevor die Geige mit einer langen Phrase von auf und absteigenden Halbtönen erstmals über dem obsessiven, erregten Klavierspiel einsetzt. Im gesamten Anfangsteil bleiben Geige und Klavier strikt bei ihren eigenen musikalischen Gedanken. Auf die Einführung einer eher feierlichen, gesangsartigen Melodie in der tiefen Lage des Klavieres antwortet die Geige wieder kontrastierend: erst später im Satz übernimmt sie das Klavierthema. Am Ende dieses langen, motivisch reichen Satzes beschließen Fragmente des Themas vom Beginn mit den absteigenden Quarten und den getragenen, absteigenden Halbtönen der Geige die Musik energisch in a-Moll. Der zweite Satz ist das emotionale Zentrum des Werkes, ein „Gebet für die Unschuldigen“. In einem Artikel über Pizzetti für Musical Quarterly aus dem Jahr 1923 beschrieb Gatti den Ablauf mit poetischen Worten: „Hier beruhigt sich der Sturm; der Mensch findet zum Glauben zurück und klammert sich mit jeder Faser seines Seins daran; jenen Frieden, den die Mitmenschen ihm nicht geben wollen oder können, erfleht er demütig von Gott, wobei von seinem Lippen die zärtlichsten, einfachsten, innigsten Worte fließen, die er seit der Kindheit gesprochen hat.“ Mit ihrer direkten und flüssigen Form ist Pizzettis Musik in diesem „Gebet“ gelegentlich deklamatorisch, doch immer sehr melodisch. Das noble Anfangsthema in C-Dur ist ausgesprochen gesangshaft: Laut Gatti habe sich der Komponist diese Melodie gesungen zu den Worten: „O Signor Iddio nostro, o Signore, abbi pietà di tutti gli innocenti che non sanno perchè si deve soffrire“ („O Herr, unser Gott, o Herr, erbarme Dich all jener Unschuldigen, die nicht wissen, weshalb sie leiden müssen“) vorgestellt. Das gleiche Thema erklingt später im Satz noch einmal intensiv und leidenschaftlich (nun in E-Dur, und auf der Geige). Der Finalsatz zeigt Optimismus und Erneuerung, ist allerdings in rein musikalischer Hinsicht kaum so fantasievoll und erfinderisch wie die ersten beiden Sätze. Aber er sprudelt über vor tänzerischer Lebhaftigkeit, die zu einem ausgedehnten und prächtigen Abschluß führt. John C. G. Waterhouse, der führende britische Fachmann für die italienische Musik des 20. Jahrhunderts, zweifelte nicht an der Qualität von Pizzettis Violinsonate, die er als „die bei weitem eindrucksvollste, jemals von einem Italiener geschriebene Sonate für Violine und Klavier“ bezeichnete. Sie wurde regelmäßig im Ausland gespielt, und der Komponist bezog sie in ein Konzert mit seiner Kammermusik ein, das am 5. März 1930 während seines ersten Aufenthaltes in den Vereinigten Staaten in der Library of Congress in Washington DC stattfand. Er war dem amerikanischen Konzertpublikum bereits bekannt: in der Ankündigung seines Besuches im Jahre 1930 bezeichnete das Magazin Time Pizzetti als „den berühmten italienischen Komponisten“ und feierte seinen Aufenthalt als „bedeutendes Musikereignis“; zu den Förderern gehörten Pizzettis Freund Toscanini, der Direktor der Metropolitan Opera Giulio Gatti-Casazza, Helen Astor und Elizabeth Sprague Coolidge, die Pizzettis Klaviertrio 1925 in Auftrag gegeben hatte (wie später auch sein zweites Streichquartett). Yehudi Menuhin nahm die Violinsonate im Mai 1938 mit seiner Schwester Hephzibah auf—ein beachtliches, aber wohlverdientes Vertrauensvotum einer britischen Schallplattengesellschaft für ein modernes italienisches Instrumentalwerk von fast einer halben Stunde Dauer. Pizzettis Tre canti wurden 1924 zuerst für Cello und Klavier geschrieben und danach vom Komponisten für Violine transkribiert. Diese Musik ist weit weniger anspruchsvoll, kürzer und weniger emotional als die Violinsonate, verströmt aber beträchtlichen Charme in den ersten beiden Stücken, und wird im dritten zunehmend dramatisch. Castelnuovo-Tedesco hat die Tre vocalizzi 1928 ursprünglich als Vokalisen für Gesang (ohne Text) und Klavier geschrieben. 1930 wurden sie dann für Violine und Klavier von Mario Corti bearbeitet, einem ausgezeichneten italienischen Geiger, der sich als einer der ersten für die Violinsonaten von Pizzetti und Respighi engagierte. Corti erkannte, dass sich diese Stücke gut transkribieren ließen; dafür nutzte er in eindrucksvoller Weise Violintechniken mit reichlichen Doppelgriffen und Flageoletts sowie stark erweitertem Tonumfang mit Oktavtranspositionen, um die ganze Bandbreite des Instruments zu erfassen. Jede Vokalise hat einen Untertitel. Die erste ist ein rhapsodisches Andantino mit dem Titel Pan ed Eco; die zweite ist feierlich und melancholisch, Come una nenia marinaresca („wie eine Seemannsklage“); und die dritte, Tempo di Fox Trot, hat den Untertitel American Music; diese sollte Castelnuovo- Tedesco ein Jahrzehnt später aus erster Hand erleben, als er eine erfolgreiche Karriere in Hollywood begann.